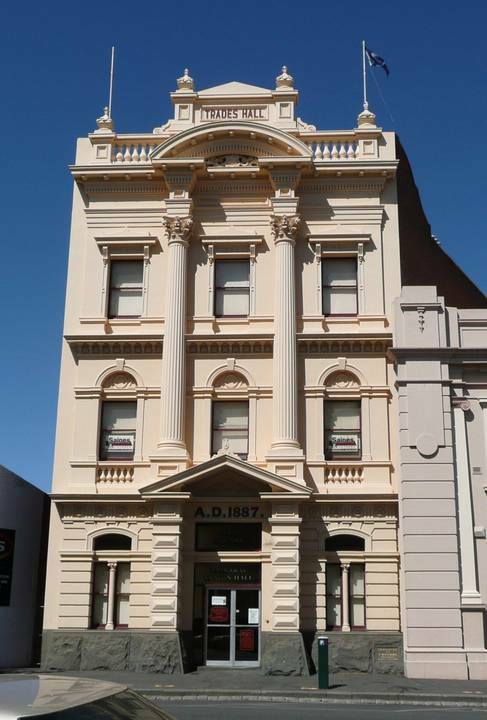 The Ballarat Trades Hall was constructed in 1887-88 as meeting place for Ballarat's trade unions and as offices for the Ballarat Trades and Labour Council. It is a three-storey brick building set on a sharply angled site. Its rendered facade is executed in a grandiose mannerist design using giant Corinthian orders and broken pediments. The hall is located on the ground floor with offices at the front and the central bluestone stair leads to more office space on the 1st floor and a meeting room on the second. With the exception of the facade, the building is simple, functional and unadorned. The building was designed by prolific Ballarat architects, James and Piper, and built by local contractors, Leech and Outtrim, at a cost of £2,128. Only Ballarat tradesmen were allowed to work on its construction. The Ballarat unions associated with the new building had a long history of industrial and political activity in colonial Victoria. As early as 6 May 1856, building workers achieved an eight-hour day, two weeks after the success of the Melbourne stonemasons. Other craft unions followed suit and many successes were achieved in the next decade. The depression of the 1870s and the establishment of a structured society in Ballarat jeopardised those earlier won conditions and resulted in the formation of the United Eight Hours Association in July 1874. The association held their meetings at the Buck's-Head Hotel in Bridge Street. In 1883 a procession commemorating the eight hours day was inaugurated and the organising committee developed into the Ballarat Trades and Labour Council in the same year. The procession became one of Ballarat's major festivals and its profits funded the construction of the Trades Hall in 1887. The Ballarat Trades Hall reflected the growing status of organised labour in this industrial labour in this industrial city and in the colony generally. In April 1891, it was the venue for the Seventh Inter-Colonial Trades Union Congress held during the eight hours anniversary celebrations. This congress, the first to be held outside of a capital city, was the largest and most influential of the pre-federation union congress and it firmly established the moves to form the Victorian Labor Party. The Ballarat Trades Hall remains largely intact and is of significance because of its particular associations with the 8-hours movement and the formation of the Victorian Labor Party, as a physical manifestation of the drive in the last century to establish unionism as an integral part of Victorian society and for its contribution on the historic townscape of Ballarat.